U14G NJ STALLIONS 04 STING NPL TAKE 2ND PLACE @ 2017 WAGS INVITATIONAL! 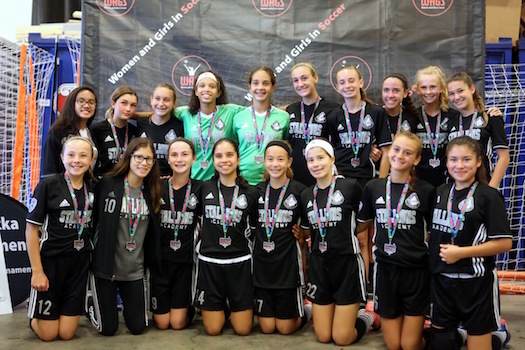 The U14G NJ Stallions 04 Sting NPL girls team finished in 2nd Place at the 2017 WAGS INVITATIONAL held in Maryland. Over 5 games including the Final, the 04 Sting NPL girls scored 6 goals, allowing 4 in very closely contest games against top girls programs from Maryland, Delaware, Virginia and Ohio. The scorelines for each game were as follows: 0-2L to Pipeline SC (#2 in MD), 2-0W vs Delaware FC 04 (#1 in DE), 2-0W vs Penne AC Utd (Ohio North), a 2-1W (semifinal) vs Arlington SA 04 #1 in VA, #15 Nationally ranked, 0-1L (Final) vs TFA Elite 04 (#1 in Ohio South). The 04 Sting NPL girls are now ranked #12 in NJ, #6 in Region I, and are currently #12 Nationally ranked. The 04 Sting NPL girls look to continue to progress in NPL and USYS Eastern Regional League in the Spring of 2018.